Lt. 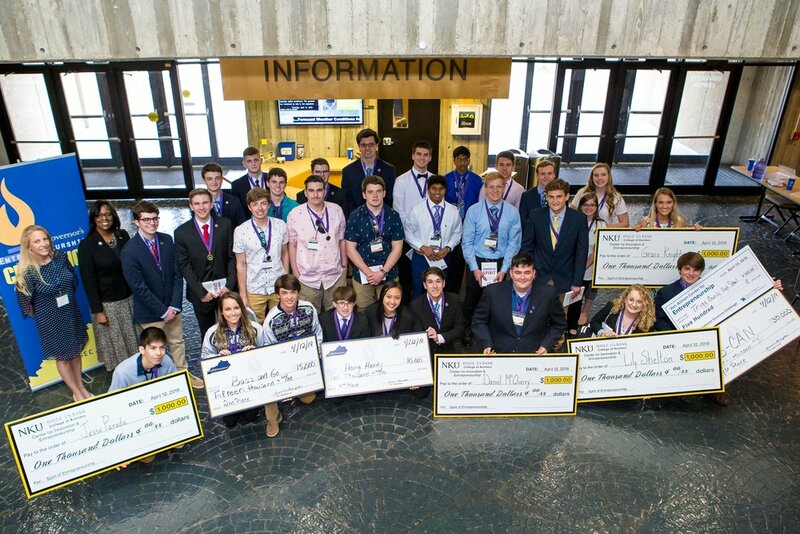 Governor Jenean Hampton awarded four winning teams from across Kentucky over $65,000 in scholarships on Friday April 12, 2019, at the 3rd annual Lt. Governor’s Entrepreneurship Challenge (LGEC) Finals at Northern Kentucky University. 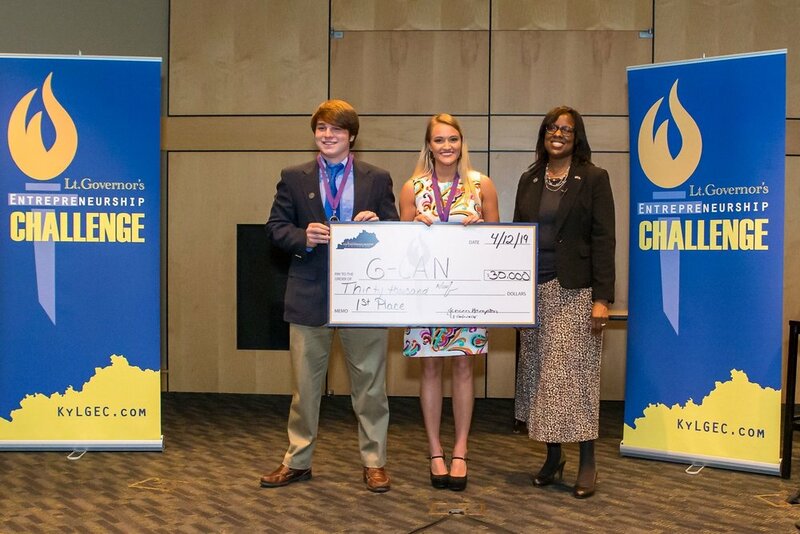 “G-CAN” from Trigg County High School won the top prize at the Lieutenant Governor’s Entrepreneurship Challenge Finals. Advised by Lisa Ricks, G-CAN team members Cade Bleidt and Grace Knight each won $15,000 in scholarship funds to be used at any in state post-secondary school or program. G-CAN pitched a prototype for a medical alert bracelet that delivers aid in the event of a medical emergency attack, even if someone is unconscious and cannot press a button, immediately notifying their emergency contact or 911. The device would be programmable to accommodate specific parameters, helping those with conditions including seizure disorders, Alzheimer’s disease, or dementia. The second-place team, Bass and Go, Clay Christopher, Hannah Wesley, and Daniel McQuerry with Lt. Governor Jenean Hampton. The third-place team, Lock Box, Ethan Gilliam and Colin Mooney. from South Warren High School. The fourth-place team, Hang Handy, Marcello Teixeira, Trenton Dambrowitz, Christie Lin, from Greenwood High School. University of Kentucky’s Von Allmen Center for Entrepreneurship presented an award of $500 to Trigg County High School to be used to support the student team’s business efforts and to underwrite the school’s entrepreneurship initiatives. The University of Pikeville also awarded a prize package to G-CAN as the winning team in healthcare innovation. The Governor’s School for Entrepreneurs offered spots to the two top teams to attend the three week GSE program this summer. The winning team was also offered a day to observe the inner workings of the Kentucky Castle in Versailles, while the team’s mentor was awarded with a one night stay in the castle. Additionally, Union College and Asbury University provided the top team with additional scholarships if they choose to enroll at their schools. 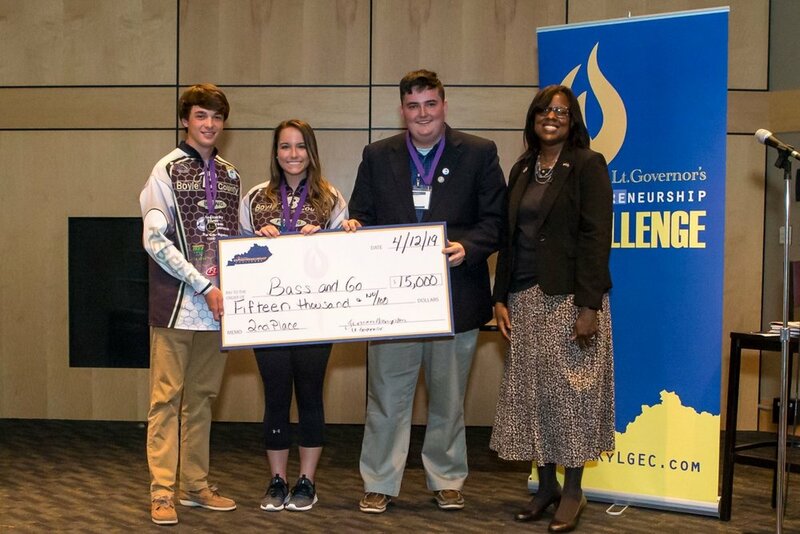 Northern Kentucky University awarded $1,000 to four students demonstrating specific outstanding skills related to successful entrepreneurship. Sponsors and partners for LGEC included Kentucky Science & Technology Corp., GlowTouch Technologies, Alltech, Delta Dental, Toyota, Commonwealth Credit Union, St. Elizabeth’s Healthcare, LGE and KU Foundation, Mako Medical Laboratories, the National Christian Foundation, NKU Haile-US Bank College of Business, as well as private donors. This year’s impressive judge panel included Dr. Sharon Kerrick, Dean of Bellarmine University’s Rubel School of Business; Dr. Brian Houillion, Chief of Staff and Executive Director of the Office of Financial Management for the KY Department of Local Government; Wendy Bellew, Founder of E-Commerce business Ruffle Girl; Bill Marshall, of Jiseki Health Inc. and Chairman of Frankfort Sister Cities Commission; and Chad Price, Founder and CEO of Mako Medical Laboratories.